Formulas derived from info found here. This plan maximizes the total payout. 62 is the earliest you can retire; retiring at 66 is "full" benefits; anything earlier than that and you get a reduction in payout per month. Anything later than that and you get a bonus per month, up until you're 70, at which point the bonuses cap out. But whenever you decide to retire locks in your pay rate. The x values for the discontinuity are at 79 yrs, 8-9 months. hmmm I don't see 48 as a death age. 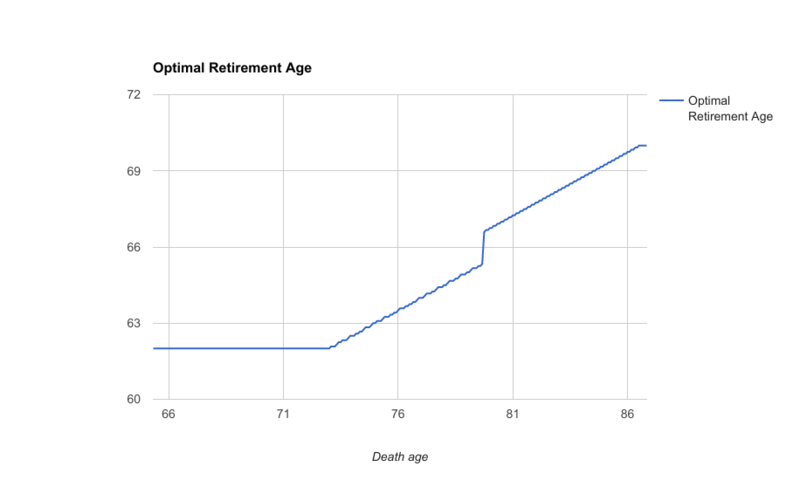 when should that person retire? Now?